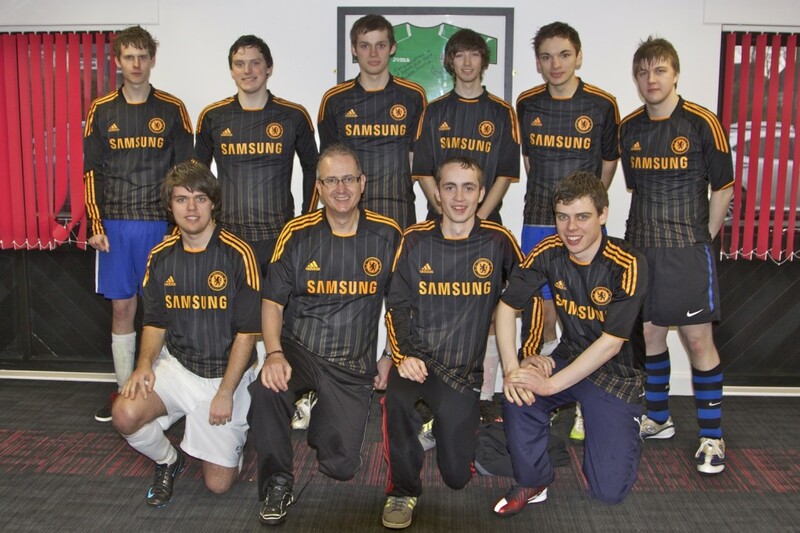 Steve Burnage and his Chelsea team came from Anglian’s London North West region to take part in this year’s Premier League in a Day, raising money for Sport Relief and in hope of finishing in a similar position to Roberto Di Matteo’s Chelsea squad. A big thank you to everyone who sponsored me and the team up at Norwich on Saturday for Sport Relief and Anglian’s Premier League in a Day competition. In the end we raised £1020 for such a worthy cause. What a day! David Walliams swimming the Thames was a doddle compared to this ‘eh lads. We arrived at 8.15am after a drive up from Essex. Only 9 made it for first game at 9am and after each game, you had 4 minutes to get to the next pitch before the klaxon sounded to start the game again; if you were late, you conceded a goal. The rain pelted down, it was cold and we were soon knackered, but my brave lads kept fighting on. Clearly most were unfit, but as a team we refused to give up (including yours truly). 11 hours later we finished, having played 35 games of the planned 38, with only 3 other teams dropping out on the way. It looked like a John Wayne tribute night as grown men were reduced to walking like toddlers as the pain tore at their calfs, thighs, ankles and ribs. Bodies, which had recently been used to a Sunday stroll with the dog, were battered by the endless number of games and the knocks along the way. There were highlights as we beat Norwich, who were winning at the time and a lot of laughs along the way. No one will forget Matt’s mad lament at the whole Spurs team who were 3-0 up at the time, still played it back continuously to their keeper! We had the player of the tournament with our own Lionel Messi, Sam Southgate, who mesmerised everyone with his skill and speed of leaving the pitch with cramp! James won every award for bravery and sheer barmyiness as he dived, pushed and threw himself forward at every occasion. 3 lads took shots to their tender parts, which make your eyes water, but stood strong again within minutes. Steve & Chris finally made it after a 4 hour train journey, Michael Palin would have been proud to support the tiring troops and the two Dans fought like tigers. Ben banged them in the net time after time. Olly was great in goal and somehow we all got through the day. Team Chelsea we didn’t win, but you all deserved a medal for enduring one of the sporting calendars most challenging events, which certainly sorts the men from the boys! You were all stars and I was proud to be your manager! Many thanks everyone who played and all those who sponsored us.